In food processor or blender, place roasted peppers and half-and-half. Cover; process on medium-high speed 30 seconds until smooth. Set aside. In deep 12-inch nonstick skillet, heat 2 teaspoons of the oil over medium-high heat. Add potatoes. Cover; cook 10 to 12 minutes, stirring frequently, until tender. Remove from skillet; cover to keep warm. In same skillet, heat remaining 2 teaspoons oil over medium-high heat. Cook beef, salt and pepper in oil 2 to 3 minutes, stirring frequently, until beef is browned. Add broccoli and potatoes. Pour reserved red pepper sauce over mixture; gently toss to coat. Reduce heat to low. Simmer uncovered 2 to 3 minutes or until broccoli is crisp-tender. Sprinkle with tarragon. 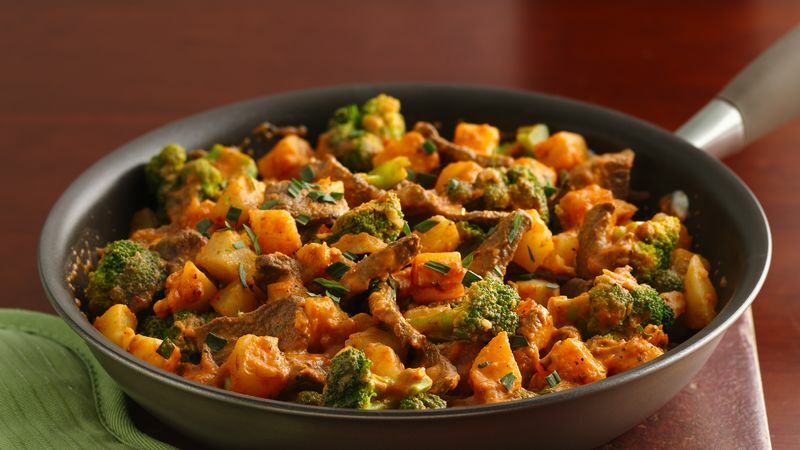 This hearty skillet dish features meat, potatoes and vegetables, so all you need are rolls and dessert to complete a quick, delicious meal!